Just like school kids Rebecca and I are very much looking forward to this Wednesday’s Seamanship class as we will be taking a field trip to the local sail loft. This is the same place that Rebecca and I took our torn mainsail in to get repaired back in November. As I understand it, the purpose of the trip is for Andy and/or John at the Kingston Sail Loft to help the class with the course section on Marlinspike Seamanship. If there is one area of the course that we should do well on I think it will be this. We are both much better at knot tying than we are at chart plotting, that’s for sure! We were given a bit of homework for this subject which included reading up on the various types of line (nylon, polyester, polypropylene) and their uses, as well as practicing how to tie various knots. 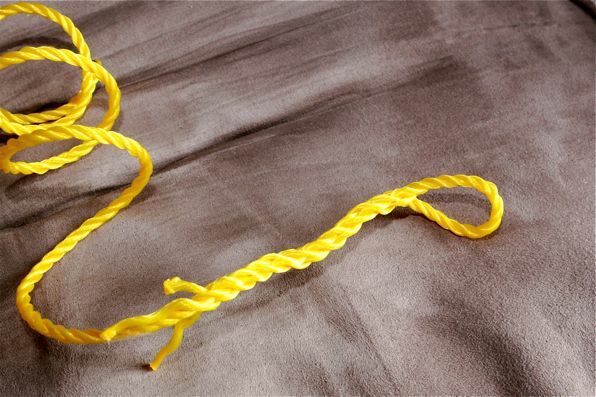 We even went out and purchased some cheap three-strand rope yesterday so that we could practice splicing! Not bad, eh? One thing I am looking forward to doing while at the loft is picking the brain of either Andy or John about what they would recommend we carry for an emergency sail-repair kit. I have been collecting various lists of items from sources on the net. I’m planning on printing these lists off and bringing them with me so that the guys can take a look at them and give me their opinion. I’ll be sure to post our final list once everything has been decided. There are “pink” jobs, “blue” jobs and then there are “brown” jobs!